The San Diego Union-Tribune first identified the improper spending, triggering a federal investigation by the Justice Department. To conceal the personal expenditures, family dental bills were listed as a charitable contribution to "Smiles for Life," the government alleges. Tickets for the family to see "Riverdance" at the San Diego Civic Theatre became "San Diego Civic Center for Republican Women Federated/Fundraising," according to the indictment. Clothing purchases at a golf course were falsely reported as golf "balls for the wounded warriors." SeaWorld tickets worth more $250 were called an "educational tour." 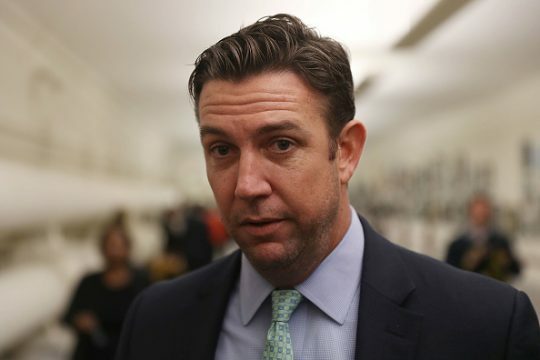 "The indictment alleges that Congressman Hunter and his wife repeatedly dipped into campaign coffers as if they were personal bank accounts, and falsified FEC campaign finance reports to cover their tracks," said U.S. Atty. Adam Braverman. "Elected representatives should jealously guard the public’s trust, not abuse their positions for personal gain. Today’s indictment is a reminder that no one is above the law." House Speaker Paul Ryan (R., Wis.) said Hunter would be removed from his committee assignments pending resolution of the case. Hunter is running for re-election in California's 50th Congressional District in San Diego County. His campaign called the charges politically motivated and said he won't drop out of the race. He is the second Republican congressman to be indicted in the last month following insider trading charges against Rep. Chris Collins (R., N.Y.). Hunter and Collins were the first two members of Congress to back Donald Trump's presidential campaign in 2016. Hunter's Democratic challenger, Ammar Campa-Najja, said the indictment increased his opportunity to flip the seat in the red district and blasted what he called Hunter's selfishness. It was more than $1,300 in video game purchases made by Hunter's campaign that first drew the attention of federal election officials and the San Diego Union-Tribune. At the time, Hunter blamed his son for the video game purchases, saying he had used the wrong credit card to sign up for a recurring purchase. Further reporting found more unusual spending by Hunter’s campaign, including a $250 airplane ride for the family rabbit and payments to nail salons, his children’s private school and a Phoenix resort. Hunter vowed to conduct an internal audit of campaign spending and reimbursed his campaign some $62,000 for spending on oral surgery, a family trip to Italy and Disneyland gift shop purchases. His wife, Margaret, handled his FEC reports and was paid as his campaign manager, although Hunter has avoided blaming her directly. This entry was posted in Politics and tagged Duncan Hunter, Paul Ryan. Bookmark the permalink.